The beautiful Amish Kaitlyn Wall Unit is equipped to host every evening in your living room or family room. 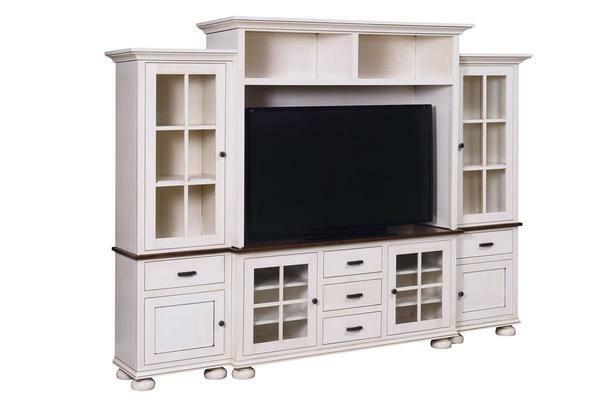 This Amish made entertainment center has it all with storage, exquisite style and the strength of Amish woodworking. Sit down in front of the Kaitlyn and come together for an entertaining evening. Enjoy a video game tournament, listen to your favorite music or have a movie marathon with your television featured within this gorgeous display. The Kaitlyn is full of features that make entertaining easy. Solid wood shelving, storage drawers and cabinet space provide room for media collections as well as treasured keepsakes you wish to display. Rounded bun feet add an elegant element to the base of the Kaitlyn, while the moldings and detailing contribute to an impressive design. The Kaitlyn Wall Unit is offered in two custom sizes with either a 116 1/2" width or a 104 1/2" width. Select from eight wood species and a variety of stain options. Rustic woods that feature natural knots are also available and come standard with filled knots. Be sure to view the Amish Kaitlyn Tower and the Amish Kaitlyn Hutch for matching options.